These distinctive layered neck pieces are handcrafted with individuality and uniqueness in mind. A perfect statement piece that's suitable for everyday wear as well as special occasions. Inspired by the ripples in water, the patterns in sand and the surfaces of rocks and pebbles. 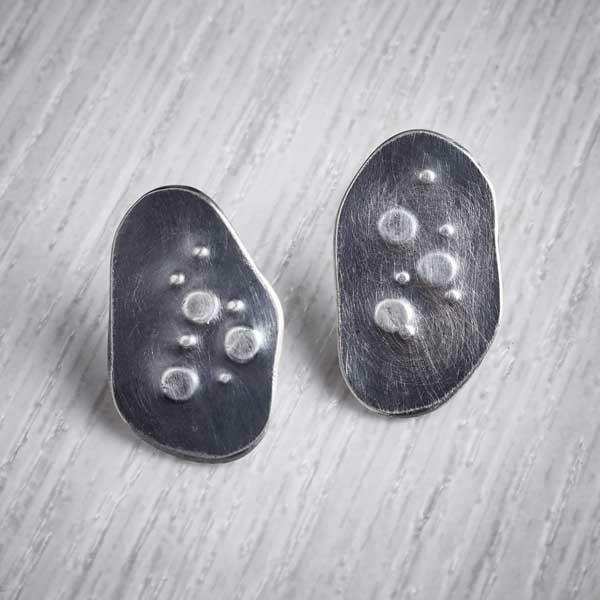 Three layers of recycled textured silver are juxtaposed and held firmly in place with silver rivets. The riveting process incorporates tiny tubes of silver between each layer to keep them distinct and separate so they do not touch. Seashore necklets are all handcrafted and therefore sizes vary slightly from necklet to necklet. These dimensions are approximate. Formed from the flattened and textured bowls of three separate sterling silver teaspoons mixed with 100% recycled EcoSilver. Hung from a 40cm Sterling Silver Cable Necklet with a bayonet clasp.